Posthumanism represents a significant new research direction both for International Relations and the social sciences. It emerges from questions about inter-species relations which challenge dominant perceptions of what it means to be human. Rather than seeing the human species as ‘in nature’ posthumanist thinking considers the species as ‘of nature’. The work of posthumanist thinkers has sought to dispute accepted notions of what it means to be human, raising profound questions about our relations with the rest of nature. The volume commences with an overview of the influence thinkers have had on the development of posthumanist thinking. Key ideas in International Relations are interrogated and reconceptualised and specific case studies are presented with a focus on inter-species relations. The work allows for a consideration of the limits of the posthumanist move and provides space for critics to argue that such an approach opens the discipline up to a biological determinism, and that a focus on inter-human relations should mark the boundaries of the discipline. 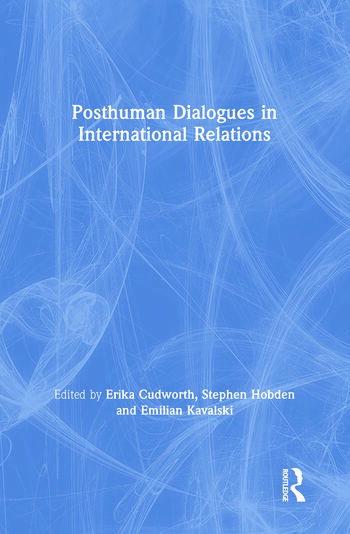 The essays collected in this volume provide an overview of contributions from posthumanist thinkers with the particular intention of providing a succinct introduction to the area and should appeal to scholars and students in Politics, IR and philosophy. Erika Cudworth is Professor of Feminist Animal Studies in the School of Social Sciences, University of East London where she teaches International Relations, researches in the fields of international political theory, critical animal studies and gender and generally thinks about things posthuman. Stephen Hobden - Reader in International Relations in the School of Social Sciences at the University of East London, where he teaches International Relations theory. Emilian Kavalski – Associate Professor of Global Studies at the Institute for Social Justice, Australian Catholic University (Australia).